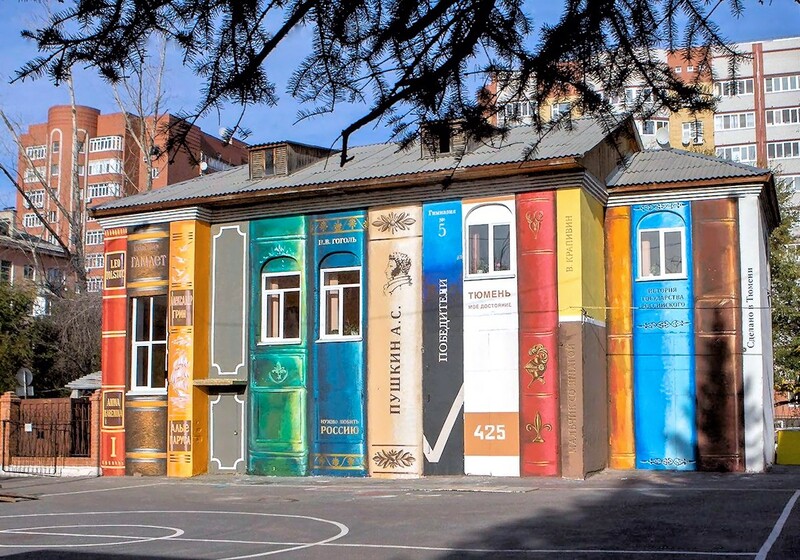 They say that Russians are the “readingist” people on earth, but this house in Perm takes the cake. It’s a real full-size house that people live in. One wonders if the residents are avid readers… they’re certainly handy and crafty (in the good sense of the word). The house of the blacksmith Sergei Ivanovich Kirillov, located in the village of Kunara in Sverdlovsk Oblast, is justly famous for its striking beauty… tourists are riveted to the spot. Another view of the Kirillov House. The house resembles a fairytale tower; Kirillov built it in the middle of the 20th century… he began work in 1954 and he finished it in 1967. Kirillov inherited the house from his grandfather. The building was in poor condition and needed repair. Since then, Kirillov hasn’t stopped working on the house and decorating it. In the image above, Kirillov’s daughter Lyudmila touches up the paint on the house’s façade. Figures of children, riders, birds, missiles, Soviet symbols, heroes, different phrases, and many other items decorate the house. Today, Kirillov’s widow, Lydia Kharitonovna, lives in the house. In all of Russia, you won’t find another house that’s just as beautiful as this one is. In 1999, it won an award as the most beautiful house in the country. In the image above, we see Kirillov’s daughter Lyudmila in the courtyard getting ready to refresh the house’s paint. The house stands on a busy highway, but Kirillov’s widow never locks it up. Lydia has plenty of help with the upkeep of the house from people who appreciate her late husband’s creation; he was a master who spent his entire life creating this fairy tale house.